For Parents, Justice Elusive In China School Collapse The most politically sensitive story to come out of the earthquake that hit southwest China last May is the question of why so many schools collapsed. Since the earthquake, parents who have demanded accountability for the deaths of their children have been punished. One couple shares their frustration. 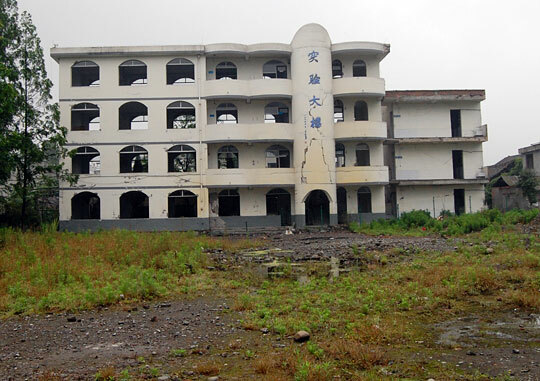 Last May, Juyuan Middle School outside the city of Dujiangyan collapsed in the earthquake. Hundreds of students were trapped, and all through the night, workers brought out the gray, twisted bodies of children. One couple whose daughter died at Juyuan Middle School tells NPR that maybe 700 or 800 children died at this one school alone. And they're convinced that shoddy construction is to blame. The site where the school used to be is now an empty field, seen here in the foreground. At the site, there are eight altars made out of brick and rubble from the collapsed building. 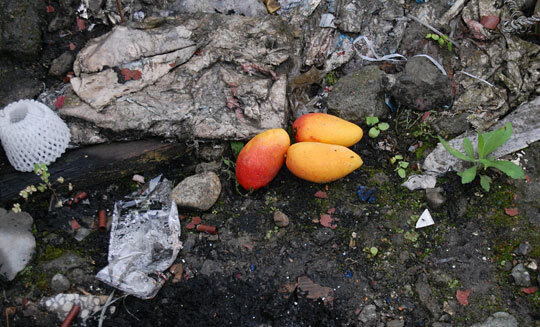 Someone left three mangoes as an offering to the children who died last year. The most politically sensitive story to come out of the earthquake that struck southwest China last year is the question of why so many schools collapsed, killing scores of children. It's a story about justice denied. And one the government does not want told. Since the earthquake on May 12, 2008, parents who have demanded accountability for the deaths of their children have been punished for it — threatened, harassed, beaten and detained by local authorities. 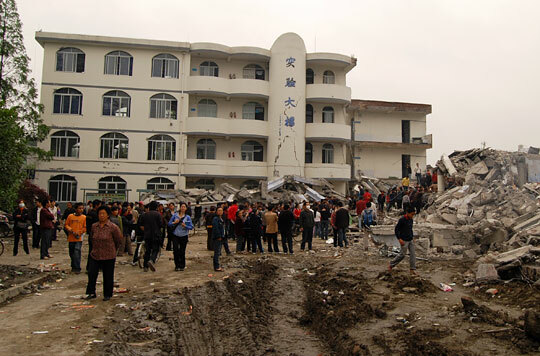 One such school, Juyuan Middle School outside the city of Dujiangyan, collapsed. Hundreds of students were trapped inside. All through the night, workers brought out the gray, twisted bodies of children. Nearly a year later, a couple whose 15-year-old daughter was killed when Juyuan Middle School collapsed shares their frustration. NPR agreed not to use their names out of concern for their safety. They carry with them a few photos of their daughter's short life: There she is at age 3, bundled into a thick, red winter coat. At age 8, leaning against a tree. And at 14, in her class photo with a friend's arm wrapped around her shoulders. She dreamed of being a fashion designer. She was beautiful. And as with most of these families, she was their only child. The dad is quiet; he keeps his eyes lowered. The mom is talkative, with a short, brushy haircut and a flash in her eyes. Their daughter was pulled from the wreckage at 1 a.m., more than 10 hours after the earthquake hit. "When her aunt touched her hands, she could feel her pulse," the mother says. "She never answered when we called to her. But her hands were very warm when we touched them. The doctors said they couldn't save her. We stayed with her body all that night in the cold." They buried their daughter behind their home and planted gingko trees near her grave. Although China's government on Thursday released its first tally of children who perished in the quake — more than 5,300 — there has been no official, public count of how many died at Juyuan Middle School. "The government told us there were 284 dead," the father says, "but in reality there were more." The couple says as many as 700 or 800 children may have died in this school alone. They're convinced that shoddy construction is to blame for the deaths at Juyuan Middle School. Some parents have said the person in charge of quality control for the school's construction took bribes and that the materials used were not of good quality. They use a term that's become associated with these schools now: "Tofu dregs construction." "All the parents said that it's because of the tofu dregs construction," the mother says. "The school should have been rebuilt years ago," the father says. "The quality problems were terrible. Plus, there were too many students there; it was completely overloaded. No wonder it collapsed." "But instead of building a new school, the officials just painted it over and replaced doors and windows," the mother says. "They made it look as if it were new." Soon after the earthquake, the parents of Juyuan mobilized. They pooled their money for a lawsuit. It came to nothing. "It disappeared," the mother says. "The government is in charge," the father says. "It controls everything. Whatever they say is what counts. How can you sue? There's no way to sue." The mother says they were furious, but that time has passed. "One day, a few parents charged into the government building and had a scuffle. So they sent in the police. The ones who were leading the charge were arrested." she says. "And the rest of us didn't dare do anything. So slowly, slowly, a year has passed by and things just faded away." The government made them an offer. They would give the parents from Juyuan 3,200 yuan each — or about $450 — for the loss of their children. The parents said no. Then the government raised the amount to 160,000 yuan each — about $22,000, the couple says. They would get half now and half later as a pension. The parents took the money. "They came to each family, and after their visit, the parents were basically pacified," the mother says. "We didn't really know what to say. My husband's a simple man. Everyone else did it, so we did, too. What can one person do? We signed." The couple says they had to take the money, even if they didn't want to: "The government told us, 'Your child is dead. She won't come back to life.' "
Last summer, when the debris from the school was to be carted away, a group of parents went to the school grounds. They weren't allowed in. Instead, they were put on a bus and taken out to the countryside. This is a common form of detention in China. "It was a way to get us out of there for the day," the mother says. "They sent us home in the evening." These parents say their movements have been monitored. They say they know phones have been tapped. Some who tried to go to Beijing to petition authorities have been arrested. No one has been held accountable. The parents have grown resigned to the fact that there will be no justice for their daughter. "What kind of justice can we have?" the mother says. "There is no way to bring back my daughter. The government did what they did. We just have to go on. Why bother thinking about it? "The contractors are responsible for these children's deaths, not the earthquake," she continues. "People said the contractors and corrupt officials should be brought out and put to death. This is the wish of the parents. But who's going to do that? Premier Wen Jiabao came to Juyuan — he knew all about what happened here. Who's going to do it?" The mother, 38, holds tight to a new member of their family: a baby boy, just a month-and-a-half old, asleep in her arms. Soon after their daughter's death, the couple decided to have another child. "I thought, 'I have to have another child,' " the mother says. "I must have a baby, even if I'm old." The mother says they will definitely tell their son about the daughter who died last year. "We'll show him her photos," she says. "We'll tell him, 'It was the earthquake that took your sister away. That's why you're here.'" The site where their daughter's school used to be is now an empty field with weeds growing knee-high. About eight little altars have been fashioned out of the brick and rubble from the collapsed building. People have left bouquets of flowers, calla lilies, gerbera daisies. There's a child's backpack next to one of these altars. People have lit incense and candles and set off firecrackers, and someone has left three mangoes — offerings to the children who died at Juyuan Middle School.